Twitter has simple 140 character restricted communication platform. There are number of ways to extend this 140 character limitation by adding more content than just 140 characters. 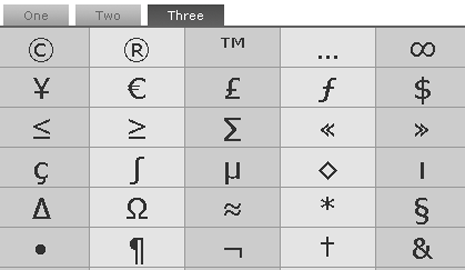 You can also add more spice to those 140 characters by using special symbols mixed with usual text characters. You can send heart, smiley, sun, star symbol in tweets from your Twitter account. 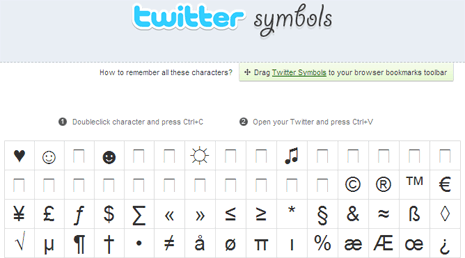 Head over to Twitter symbols for adding any listed special character to your tweets. Double click to select and then press Ctrl + C to copy the special symbol. Then goto to Twitter.com send tweet interface and press Ctrl + V to paste the special symbol. You can also use this service through quick bookmark. Twitterkeys is a browser bookmarklet that allows you to add special symbols to tweets. Besides the manual copy paste of special characters, you can add it as browser bookmarklet for quick addition of special characters to tweets. This was an extremely interesting and helpful article. TweetSmarter.com is the easiest of all of them: no copying or pasting required, you can send your tweet directly. It also highlights the characters that won’t be visible on some Twitter interfaces.